Scientific research and many before and after photos illustrate the effectiveness of microneedling to promote skin remodeling and rejuvenation. Microneedling was discovered when doctor’s tattooed flesh colored ink inside of acne pockmarks. The tattooed pocks later filled in with skin cells leading to research and protocols developed by Dr. Desmond Fernandes who, with others, invented microneedling. Dr. Desmond Fernandes at 73 years. The microneedling or dermaneedling concept is similar to lifting weights to build muscle. During weight training muscles are contracted to fatigue causing micro-injuries, the muscles become larger and stronger when the micro-injuries heal. This same concept is used for skin rejuvenation and rehabilitation using microneedling. Thin short needles penetrate the skin causing micro-injuries in the epidermis and dermis. The micro-injuries initiate a cascade of biochemical healing processes that ultimately result in increased collagen and elastin production. About ten years ago, I began giving myself microneedling treatments; there were no doctors, med spas, or estheticians available to provide these treatments at that time. Microneedling supplies were available via the Internet. After ten years, I am still a huge fan of microneedling! For nine years, I used a dermaroller, a small roller with needles embedded in it. I completed 4 to 6 deep treatments a year using a 1.5 millimeter (mm) or 2.0 mm needle length dermaroller. Deep microneedling is uncomfortable and requires numbing cream. The results are so effective that it is worthwhile to experience one hour of discomfort for this fantastic Do-It-Yourself (DIY) skin rejuvenation treatment. There is no need for numbing cream when using short needles. Short needle length microneedling causes the epidermis to become porous and greatly increases product penetration; only use gentle and pure products following a needling treatment. Longer needle lengths increase collagen, repair small scars, reduce or eliminate fine lines and promote collagen production and skin rejuvenation. Single needle treatments are used to successfully fill in pockmarks and individual lines. The prevalence of microneedling treatments that are currently available attests to the effectiveness of the process. After nine years of DIY dermarolls, I decided to try a mechanized microneedle treatment by a Phoenix naturopath who used a Dermapen to treat focus areas and did not treat the entire face. I could not believe how comfortable the treatment was! It was easy, fast and was not painful. I immediately wanted a Dermapen and learned that it costs about $5,000 and does not provide a single needle cartridge option. My pocket book said no way. I no longer wanted a Dermapen. However, I did still want a mechanized microneedling device. I researched the options and found and purchased the Derminator 1® by Vaughter Wellness. At the time, it was available for $160; the Derminator 1® has subsequently been replaced by the new and improved Derminator 2® which is currently available for $190. The first time that I used the Derminator 1® I loved it! I appreciate it’s ease-of-use, fast treatment time, and it is much more comfortable to use than a handheld dermaroller. The device is fast therefore little to no numbing cream is required unless doing deeper rolls. When I found out that the Derminator 2® was available, of course I wanted to try the newest version. I emailed Sarah and asked if she would provide a Derminator 2® device to me so that I may try it and write a review. Sarah agreed and sent me the new device. I set aside a weekend to give myself my first Derminator 2® treatment. In the past when I used a handheld dermaroller, I would microneedle on a Friday night, heal over the weekend and return to work on a Monday morning. My skin may still be recovering but it was not noticeable. After trying the Derminator 1® on some isolated areas I realized that the Derminator makes it easy to complete a comprehensive and intense treatment that requires a little bit longer healing time. During one long weekend, I completed my first Derminator 2® deep treatment. I used numbing cream on my face and neck and the same needling protocols that I’ve used in the past. 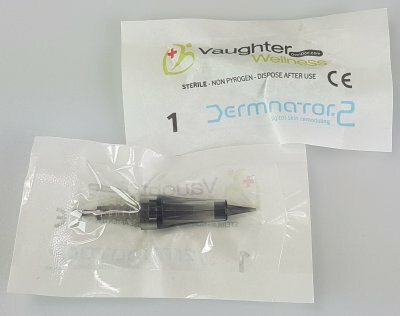 I numbed my skin for about half an hour and wiped the numbing cream off before completing a 1.5 mm needle length Derminator 2® treatment. I completed an intensive treatment covering the entire face from hairline to hairline including the front of the neck to above the collar bone. It is easy to give yourself a more rigorous treatment using the Derminator 2®in half the time that it would take using a dermaroller. Results after 3 Derminator single needle cartridge treatments on lines. Note the trace of the line as it fills in. Photo taken 6/6/18. A little different camera angle, results after 3 Derminator single needle cartridge treatments on lines. Note the trace of the line as it fills in. Photo taken 6/6/18. Detailed instructions for the Derminator 2® are posted on the Vaughtner Wellness website. It is simple to use the Derminator 2®. The user may choose to use an automated sequence or not. After turning the device on, the user is prompted to identify the type of needle cartridge being used, needle penetration speed, and the desired needle length. Once the device is operating, the user simply moves it across the skin using small circular motions. I gave myself a fairly extreme Derminator 2®treatment. It took my skin about 3 ½ days for the primary healing and then another three or four days for minor residual healing. The Derminator 2® single needle cartridge is a terrific feature! In the past, I’ve tried to complete single needle treatments but have not been successful. Following the Vaughter Wellness instructions, I used the Derminator 2® single needle cartridge on forehead and lip lines. The Derminator 2® makes it extremely easy to effectively treat these lines which then fill in with new skin cells after receiving multiple treatments over time. The Derminator 2® makes home microneedling accessible and easy at an affordable price. To increase your success with the Derminator 2® start with good health, high nutrition and sufficient sleep. If you want med spa skin on a budget in the privacy of your own home, I recommend the easy to use, effective Derminator 2® by Vaughter Wellness. This premium DIY advanced skincare treatment device improves skin health to achieve dramatic results while saving thousands of dollars in med spa charges over time. Take good care of yourself and for more skin care tips get my book "Skin Remodeling DIY: An Introduction to the Underground World of Do-It-Yourself Skincare"